The 'Platform' tab on the configuration page contains general settings that apply across the whole velpic platform. Name: What you want to call Velpic for your organisation? This is what appears on the top left of the Velpic platform. Some customers choose to have their organisation name, others choose to call it something else. Web Address: This is the custom velpic web URL for your organisation, for example, http://myteam.velpic.net. If you want to change this for your organisation, please contact the Velpic support team. Owner: This is the main owner of your account. Timezone: The default timezone all accounts will operate from. Grace Period (days): The Grace period is how many days a trainee has to complete a lesson once they are due to complete it. This is the default that is used to populate a scheduled lesson. Continuing Professional Development (CPD): This will allow you to enable CPD values for your account. Read this article for more information about enabling CPD for your account. Lesson Feedback: When a trainee completes a lesson, the lesson feedback option adds a comment box and rating system so that your trainees can provide feedback regarding the quality of the lesson they have completed. 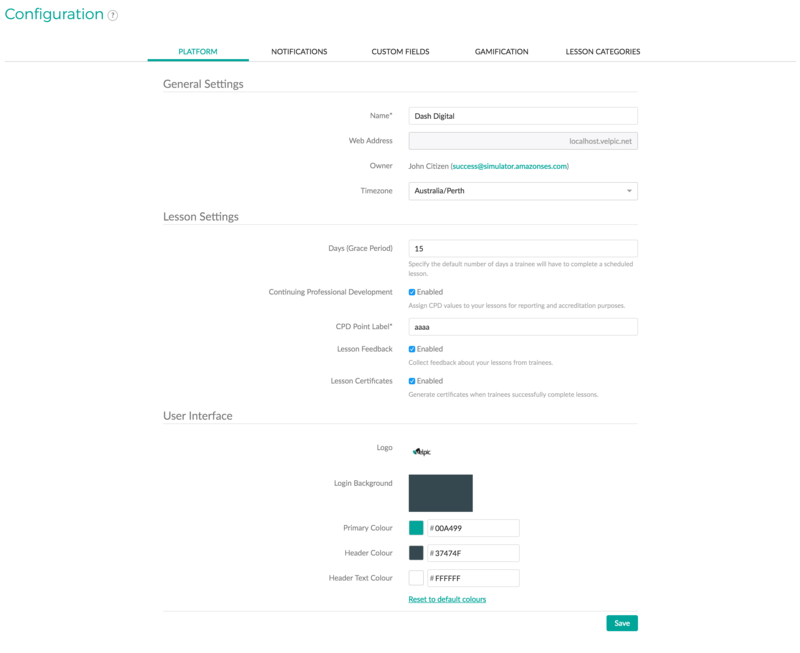 Lesson Certificates: The lesson certificates setting allows you to control whether a certificate can be downloaded by a trainee when they successfully completes a lesson. When this feature is enabled, you can also manually control certificate generation for individual lessons on the lesson settings page. The user interface section allows you to edit the design of the velpic platform, and applies to all users. For more information please see the following help article on how to customise Velpic with your organisation's branding.